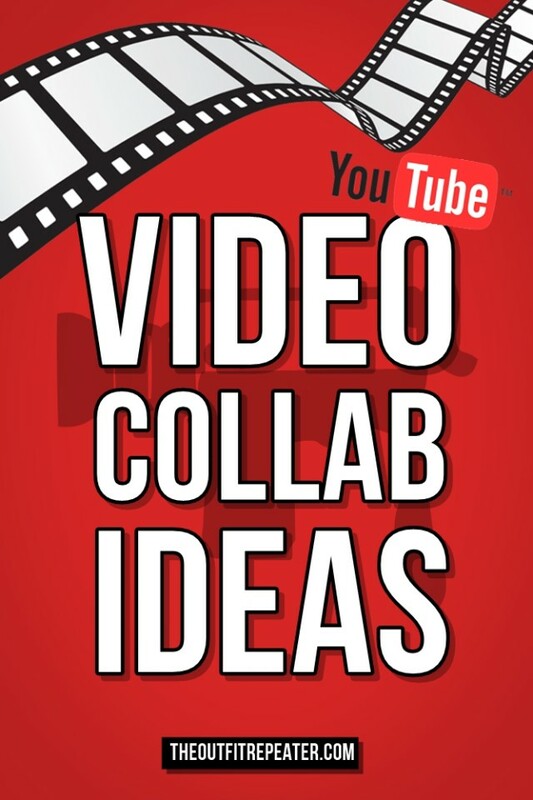 Home How-To YouTube Video Collab Ideas That Rock! A collaboration on YouTube is similar to a blog collaboration but they still couldn’t be further apart. As I covered on this blog before, coming up with collab ideas with your internet friends is kind of a drag. The finished product is usually pretty awesome but coming up with a plan, passing lots of emails back and forth, and recording videos is a tedious process. Write up a short video idea together, record your parts separately, and have one of you edit the final product. I’ve had the opportunity to make an entire video for another channel. The YouTuber had a regular Q&A segment and I simply hosted it for him one week and he posted my video on his channel. If given lots of time to plan, this is one of my favorite ways to collab. You can each trade a box in the mail and open it on camera. This would be great for unboxing videos, thrift swaps, challenges, and whatever you can imagine! Either compete in an existing challenge video or come up with one of your own. This works well for fashion and beauty channels. You each make a video around a theme like “prom night” or different decades. Your viewers would watch the videos to get the full picture. If you don’t have time to work on a video together, create one yourself! I’ve seen both big and small YouTubers react to all kinds of videos. This is great exposure to your friends channels or helping out an unknown YouTuber. This about exactly what it sounds like. Create a multi-host giveaway, maybe each channel gives out a different prize and you have to follow all the channels to win? You can get creative with setting this one up. While this is not necessarily a collab idea, this is a great way to get others involved in your videos (which is like a shout-out, right?) Ask viewers and friends to send in questions and answer them on camera. Your viewers get to know you a little better plus they see their names in your video! Each of you would think of a problem that needs solving on the internet. Maybe it’s how to get more followers online or how to style long hair. When you’ve got that figured out, you both create a video with a solution and pass the clips to one another (This is what makes it different from the “similar theme” idea above). Your video would be on your friends channel and theirs would be on yours. You can include a clip of yourself in the video to nudge your viewers to go to the other channel to see you. A review is a classic video staple. Talk about the pros and cons of the product, demonstrate how it works, and get your viewers pumped about the brand you’re reppin’. Similar to a list blog post, come up with “5 reasons you love brand X” or “8 ways you can use product X”. Get creative! Are you a fashion vlogger? Come up with a bunch of outfits from, or inspired by, a particular brand. A lookbook is a fun way to show off your style. Whether the brand supplies you with a store credit or if you’re just a big fan of the brand, make a video sharing your new products to your audience. Tons of people everyday go to YouTube looking for “how to use product x”. Supply them with that information! Be their go to person that can show them the ropes. Brands will love how you share their product with your audience. There’s a space on the right side of your homepage just for adding cool people. Why not add another YouTuber you admire? Tweet about each other, tag one another on Facebook, or post a picture on Instagram leading traffic to their channel. Most creative meme/video GIF wins a prize? But only if they’re following all of the hosts! Want to know what a great collab looks like? View my roster of videos, from my personal and character channel, in this fancy playlist I’ve created. These are some great ideas! If only I could, you know, edit videos…. Hahaha! It took me years to figure it out and another couple of years to enjoy doing it. It’s definitely a lot harder to pick up than blogging! Found you through IFB! These are such great ideas! I feel like so many people bring up doing a collab and then they don’t have any ideas and nothing ever happens. This post is a great reference for times like that. I’m really trying to get active on YouTube, so posts like this are so helpful!! That is super, Sarah! Good luck with your future collabs. I’m gonna have to check out your YouTube channel ASAP! It is indeed an awesome post… THANKS!